Gardening crew chronicles – bringing the outdoors – indoors. Thus far this winter has been mild, certainly in comparison to 2010 and 2009. If anything that has given us more time to prepare the gardens for their winter sleep. 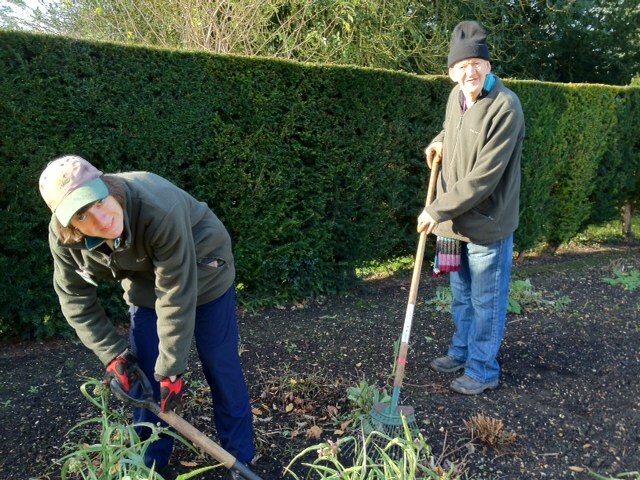 In the West garden that means clearance of the herbaceous borders, removal of some of the annual plants that we have used to fill out the summer display and the last finishing cut of the Yew hedges that frame this part of the gardens. This time last year we had significant snow and ground as hard as concrete to contend with. The downside of the mild weather is we are having to cut the grass further into the winter season because it is still putting on growth. 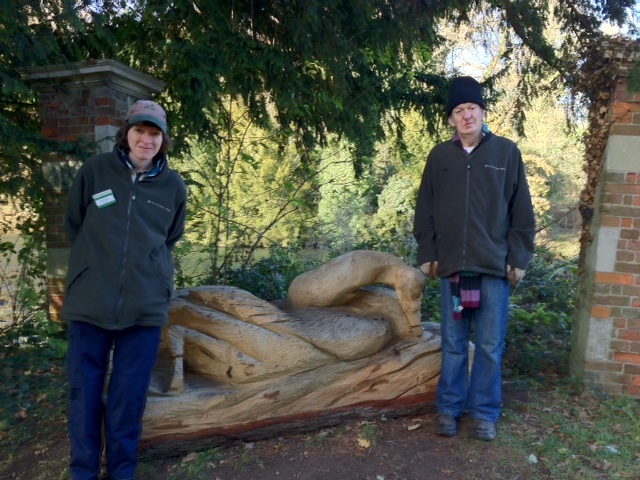 Over the last half of the year various wood carvings have been created and found homes within the grounds and gardens. This has added interest and attracted a good few positive comments from our visitors and amusement from the younger audience. There are birds, insects and in the picture below you can see a swan in the Wild garden framed by two of our clients from Thrive. Both do valuable work involving various garden tasks that are essential for the maintenance and appearance of our extensive grounds.